Discussion in 'Gran Turismo Sport' started by GTPNewsWire, Feb 10, 2019. This article was published by Kyle Patrick (@SlipZtrEm) on February 10th, 2019 in the Gran Turismo Sport category. Marcobzzcs, girabyt3, potvinsuks and 4 others like this. officialgtrch, Rinsky, girabyt3 and 2 others like this. @BLiTZ, you're up for this? @Cytoria @daan @JKcreativeworks You guys are handy with the editor! Marcobzzcs, girabyt3, JKcreativeworks and 3 others like this. You can also post on Facebook and comment on Williams JIM's post using the same hashtag, if that helps. Javielmaqui, MIE1992, Stumps_GTI and 1 other person like this. I'm gonna give this a try although my OC is a bit bland and guess replicas wouldn't count (or they might count as well). Thanks for the mention, but dare I remind you who won the « original design but with a mandatory sponsor » livery competition ? I’ll try to send them some liveries, but I don’t know what they are looking for... Creativity, attention to detail, Williams’ graphic guide fidelity ? Javielmaqui, D-Max and daan like this. Will definetely be entering this. I have a decent amount of livery-craftsmanship experience, and I think it will be a cool challenge. Javielmaqui, Strittan, Stumps_GTI and 11 others like this. Cheers, I've put stuff on twitter! Are williams gonna get more involved with GT Sport this year?Specifically the FIA Campionship. Is this gonna be a paid position? Paid in exposures. You’ll get a pile of them! Is this the actual Williams team, as in F1 or a totally different outfit? 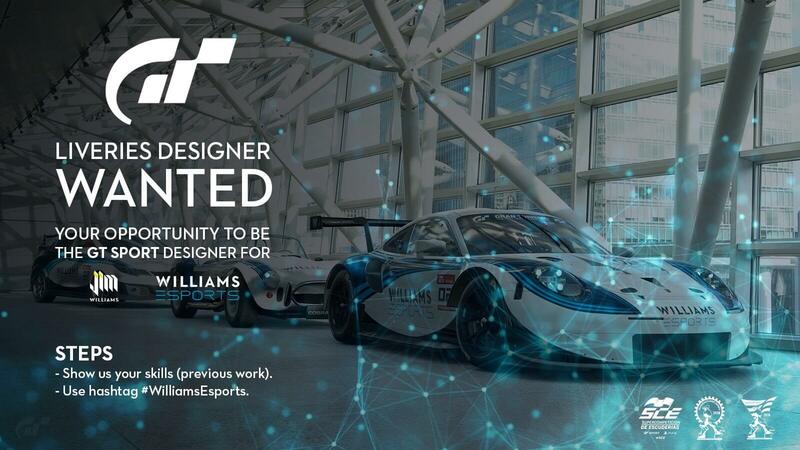 The Esports team seems to be part of the larger Williams F1 organization. A spin-off, if you will. On that note, I didn't know that William's even had any involvement with Esports. Best of luck to those who take part! I believe all F1 teams have an Esports team, at least for Formula 1.
officialgtrch, VBR and RZQSPEED like this. A mix of Prince Chiba GT-R, Endless GT86, Falken M6 and Gulf 919 will show your skills, variety and attention to the details. I'm fed up of seeing people post replica liveries for this like they're livery "designers" and designed them themselves. No, you copied something. Aaron Curtis, officialgtrch, MIE1992 and 6 others like this. I was exactly going to write that. Nothing against the people doing that, and nothing against their "skill" but iam pretty sure you should come up with new designs that has the Williams style in the core of it, like colours etc. Remaking old styles is probably not what is wanted here and yeah, quite sick of all of them..
officialgtrch, MIE1992, VBR and 1 other person like this. I don't post here much, and I'm not massively prolific with the liveries, but I do find the creation quite relaxing. Check out my gallery, no replicas, lots of Destiny and videogame stuff, UFIT protein designs, as well as some other things for specific reasons or requests. I'm never satisfied with my own work, so I'd like some independent feedback, thanks in advance! VBR and CrimsonKing like this. Yeah looking good. I'm probably not the best at livery making but I like my liveries. I have had a stab at making my own ones now. Made this one today. Exactly. Inspiration from liveries, sure. But a full replica isn’t imaginative! No, but making a perfect 1:1 replica takes time and effort and often requires thinking outside the box to get the right projection and matching materials within the confines of the editor. Most 'original' liveries are poorly made, with sloppy autotraced decals with little to no thought for how the design would work in real life. It's a different skill set for sure and you'd like to think that that Williams would take attention to detail into account if they want quality work. officialgtrch, MIE1992, Stumps_GTI and 2 others like this. I decided to not post my 'replicas' for that exact reason. Instead, I sent them a few from my own racing team that I designed without a reference.